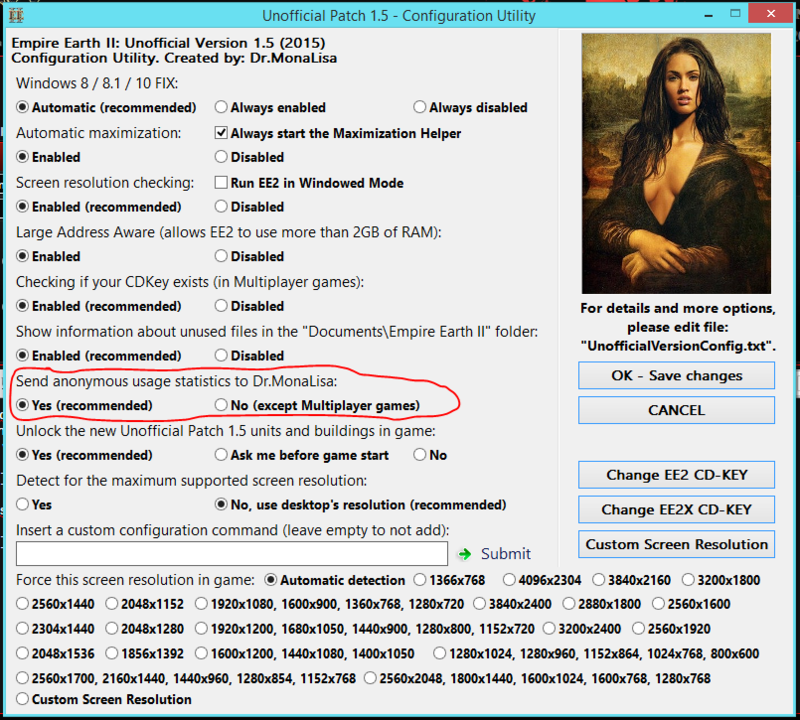 I've heard some not nice comments about the unfficial patch 1.5 recently. The comments were about the usage statistics system. Someone has just called it as a "spyware". I think it will be nice to explain how the statistics system works, what information is collected, and for what I need it. For some reasons - I need to collect statistics from all Multiplayer games (in case we had to ban someone, hopefully it will be never needed). The statistics system is nothing "hidden". I made it very visible (installer, download topic), so I'm fair with players. There are some differences between collected information (depending on version 1.5.0 - 1.5.3), but basically no personal information is collected. For Single player games even less information is collected (no PlayerName, HostAddress). Everything is just information about the system (graphics card, processor, amout of the RAM). Since version 1.5.1 there is also a "Unique ID", which is just a unique number for every computer. That's how the banning system works, and that's how I can find the same player in logs. This number is generated depending on your hardware. It's a unique number of your: hard drive, processor, network adapter. Of course this number is hashed. Thanks to this when someone gets banned, we are sure that nobody else will see "you've been banned" message. Since version 1.5.3 also Game Time is collected. Thanks to that I can see how stable the patch is (no crashes during game period). On 1.5.3 also reports of game crashes are sent to me. Those reports contain full unhandled exception message, and the same statistics as described above. The information I collect is just to know how many players use the patch per day, how stable it is, what computer performance players have, etc. Basically, when you search for something using "Google" or "Bing" - they know more information about you than me. The patch is a non-commercial project, and everything I collect is just to make it better. Thanks to the crash reports systems I was able to prepare 2 fixes for unhandled exceptions. The crashes weren't even patch-related, so it made game more stable than with the official version. Even if you don't want to send statistics - you can simply disable it in the Configuration Utility, and then track connections with Wireshark (or some other program), just to make sure that nothing is sent. Really, calling it a "spyware" really harms me, especally because I spent so much time on it (testing, programming, modding game), and I don't get any money (excluding ~3$ per month from adfly and donations (I received 2 donations within 3 years, with amout less than 20$...). The UP1.5 installer also doesn't contain any adware. The whole installation process hasn't got any hidden toolbars. The launcher doesn't display any ads... it's all clean. 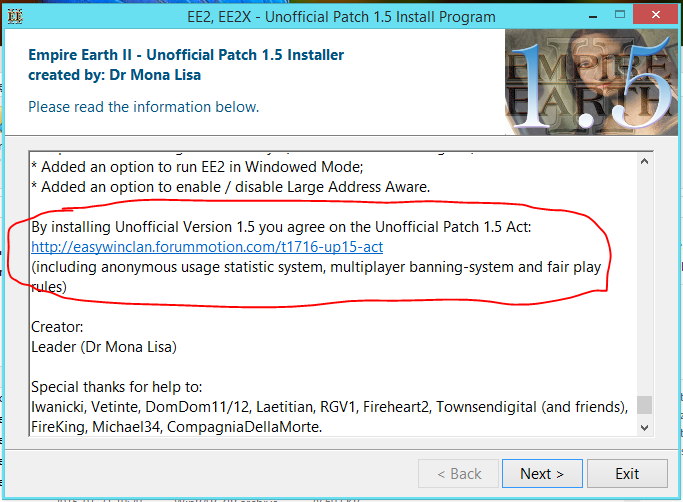 So please: respect that the patch is and always will be free and ads-less, no personal information is collected, everything can be configured and don't write gossips about it, and if you decide to do it, then at least don't use the unofficial version, because then all prosecution are very ironic. This is about all I know about the patch. Haven't read any other stuff but I do believe you. I do believe it is strictly for the game and has no information from us sent to you. You are doing a great thing I think. Hopefully, I can play soon. Ready to see if I'm still considered "good" although I never considered myself to be all that good. By the way, your English has expanded so well over the years and you sound like it was your first language. Better than most Americans, that's for sure. Hope it shows enough what statistics were/are collected for. Also I'd like to mention, that if someone in the future assume UP 1.5 of spying without showing any proof or will talk other crap about this update - will lose ability to use EE2 1.5 forever (simply will get banned). It's not because I care about that trash-talking, but because some people think they can destroy communities, troll without being punished.